Spin Palace is a premium online casino that offers great ways to play free games and win real money, as well as promotional benefits and exclusive rewards for becoming a member. Founded in 2001, the casino has established its reputation on core values of offering the best entertainment in the safest environment possible. Additionally, Spin Palace has superior quality in its player support and numerous banking options to use in multiple currencies. The casino is licensed and registered through the government of Malta, and offers players the best gaming destination in both a full desktop format and convenient mobile application. Spin Palace online casino currently provides a library of gaming content that has over 400 different selections, which a majority of the titles belonging to the online slots category. Every one of the slots is powered by the developer Microgaming, and this massive collection includes big titles such as Thunderstruck 2, Hitman, and Big Kahuna Snakes and Ladders. Styles within the online slots range from advanced 5-reel video slots with countless features to the more traditional slots with three reels and a single payline that offer simple, relaxing gameplay. Players can expect multiple ways to place bets, as well as beautiful graphics and thorough information about payouts. In addition to the large collection of slots, all games come with easy-to-use controls and a variety of betting options for every player. Spin Palace takes the security of its players very seriously and uses 128-bit SSL encryption to protect all sensitive data as it is transferred. The casino partners with financial institutions to ensure that every transaction is handled with the utmost care. Firewalls are also installed within the site that guards all players from online threats. The aspect of fairness at Spin Palace online casino is also a priority, and the site is monitored and audited to make sure that odds are fair and payout percentages are at a high level. These efforts allow the casino to be certified by eCOGRA, and the results of audits can be viewed directly on the site. As a leading online casino, Spin Palace understands the importance of having player support available around the clock. The casino offers a live chat feature which is great for instantly connecting to a representative to have urgent requests resolved. 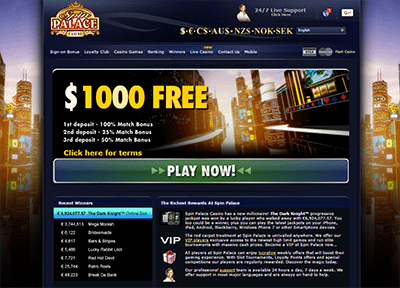 Spin Palace also provides an e-mail address that players can use in sending all general questions or comments, with a usual response time occurring in 2 hours or less. There is also a convenient resource for retrieving lost usernames and password through the support section. For players who prefer old-fashioned communication, the casino even has a toll-free number that can be called to speak with someone on the phone. In terms of banking options, Spin Palace offers multiple ways that players can add money to their accounts or cash out fast. This online casino is one of a few sites that now offer PayPal as an option for depositing and withdrawing funds. PayPal offers instant transaction processing and there are no fees to use this service. Spin Palace will also accept major credit cards for payments like Visa and MasterCard, as well as the web wallet services Neteller and Skrill. There are many of alternative methods for processing transactions with the casino such as bank transfer and personal check, but these options typically take longer to complete. Players are encouraged to visit Spin Palace and see which option will work the best for them. Players will find that being a member of Spin Palace online casino comes with plenty of great benefits, including an unbeatable welcome bonus available when first signing up. The bonus consists of three different parts which can be gained when making the first deposit into a real money account. Once the player has completed this initial deposit, Spin Palace will match by 100% for a value of up to 250£/€/$. Following on the second deposit, the casino again gives the player a matching bonus worth as much as 300£/€/$ based on a 25% match. The third and final deposit that is part of the promotion will be worth another 450£/€/$ from a 50% offered by the casino. In total, new players can get as much as 1,000£/€/$ in free credits by making their first three deposits at Spin Palace. Spin Palace has a VIP program that directly relates to loyalty points players earn by making deposits and playing games at the online casino. Every 10£/€/$ wagered will be converted into 1 club point, and players can cash in these points in increments of 1,000 to earn free casino credits. Additionally, the more points a player earns the faster they will be upgraded to the next level in the VIP program. Everyone is entered into the first level of the program, but each following level requires a certain number of points to enter and another point value to maintain VIP status. The top tier of this program gives players access to complimentary gifts from the casino and invitations to exclusive tournaments and events. Keeping up with the ever-increasing trend of being able to access gaming from a phone or tablet, Spin Palace online casino also offers an innovative mobile format of its site to every player. The mobile casino works with virtually every device, including Android and iPhone. The games and features from the full online casino have been converted and optimized to work on a mobile platform, including impressive compatibility with touchscreens. Players can also access banking options from the mobile casino, as well as all the great promotional benefits. Convenience is the name of the game with the Spin Palace mobile casino, as players will be able to enjoy free games and win real money from any location that has an internet connection available.